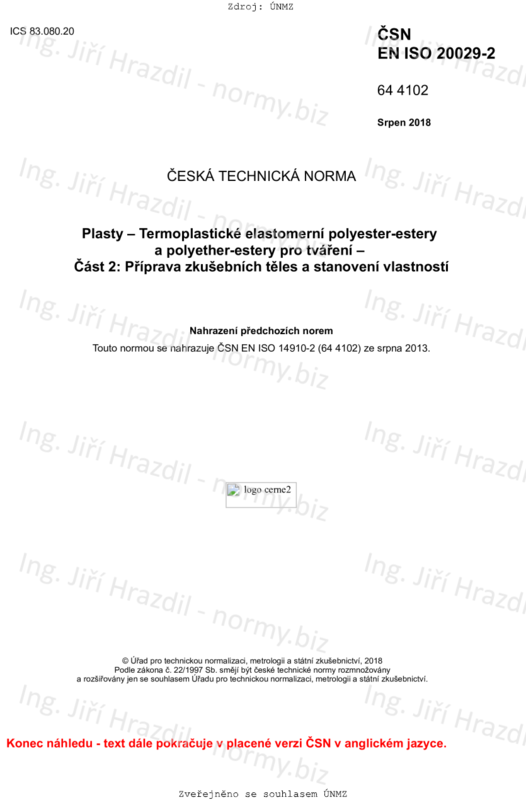 This document specifies the methods of preparation of test specimens and the standard test methods to be used in determining the properties of thermoplastic polyester/ester and polyether/ester elastomer moulding and extrusion materials. Requirements for handling test material and/or conditioning both the test material before moulding and the specimens before testing are given. The properties have been selected from the general test methods in ISO 10350-1. Other test methods in wide use for or of particular significance to these moulding and extrusion materials are also included in this document, as are the designatory properties specified in ISO 20029-1 (hardness, melting temperature and tensile/flexural modulus). This document has been developed on the basis of ISO 10350-1, as at the moment, no standard exists for the acquisition and presentation of comparable single-point data for thermoplastic elastomers. After publication of this document and the analogous document for polyurethanes (ISO 16365-2), it is the intention to develop ISO 10350-3 for the acquisition and presentation of comparable single-point data for thermoplastic elastomers, based on this document and ISO 16365-2, as the basis for the development of thermoplastic-elastomer material standards.